Yesterday afternoon, I went to SM Sucat to buy stuffs, have lunch and at the same time to stroll in the mall. I arrived at 2 P.M. then had my lunch at the food court. Right after that, I went walking and thought of important things to buy. The first thing I bought was cologne from bench then ice cream from Mc Donald’s. They just increased two pesos from the former 10-peso sundae cone. After enjoying my ice cream, I went to Book Sale and browsed for good books. I started in the computer section until the fiction section. I was not amazed by what I saw so I decided to look for new books in National Bookstore. The first thing I looked for was the top selling books list and based my browsing selection on it. 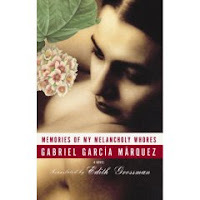 There is a new book from Gabriel Garcia Marquez (Memories Of My Melancholy Whores) and Mitch Albom (For One More Day) I am interested to buy. I do not have the opportunity to read the first paragraph of Albom’s new book because it is still wrapped, but Marquez’ first three paragraphs intrigued me. I think I have to invest my money again on buying new books. After that, I went to the Filipino-authored books and saw Jessica Zafra’s new book entitled “The 500 People You Meet In Hell”. Haha. I think the title is based on Mitch Albom’s book “The Five People You Meet In Heaven.” I have read some of its pages with large illustrations on it. Interesting to read, but advised to just borrow this book from a friend. Any suggestions on what book to buy? After my book exploration, I went to the department store to buy some toothpaste and new underwear. When I arrived home, I just remembered to check prices for bathroom scales. I am just concerned whether I am gaining weight or not. I hope I am gaining.